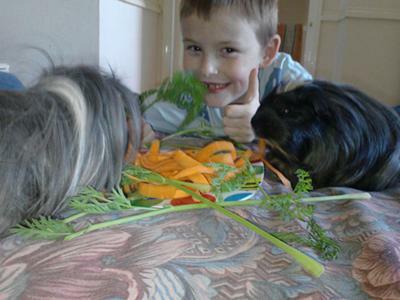 My piggies and my son making sure they get their Five a Day. Many foods are bad or even poisonous for guinea pigs. You should never feed your guinea pigs with sweets, chocolate, ice cream, chewing gum or let them drink sodas! For more info read about poisonous foods for guinea pigs. Return to Guinea pig pictures.